Obama desegregation order: Housing integration, long unenforced, to be priority. 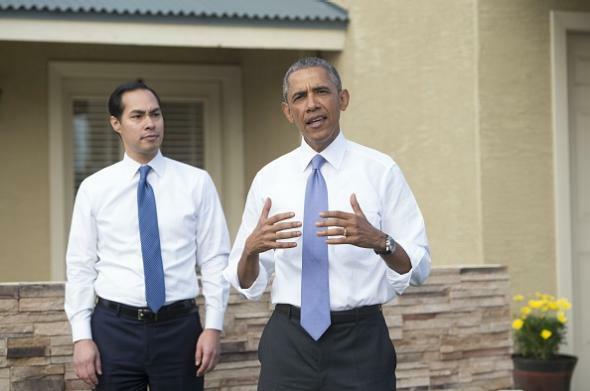 President Obama with Housing and Urban Development Secretary Julian Castro during a January appearance in Phoenix. Observers have long believed that the federal government has fallen down on the job when it comes to enforcing the 1968 Fair Housing Act’s mandate to “affirmatively further” desegregation—that is, its mandate to promote integration proactively rather than simply preventing overt discrimination. After decades of executive inaction on the issue, though, new rules being announced Wednesday by the Obama administration appear to address the problem directly. ProPublica could find only two occasions since  in which the department withheld money from communities for violating the Fair Housing Act. Texas made low-income housing available primarily in low-income, predominantly black neighborhoods. The effect of this decision perpetuated segregation. Texas may not have enacted this policy explicitly to keep blacks segregated from whites. But under the disparate impact claim which the court just affirmed, minorities can still sue Texas for enacting a policy that furthers segregation. The caveat here for celebrating progressives, of course, is that a more conservative administration might take office in 2017 and decide that HUD doesn’t actually have any obligation to promote integration—just as Richard Nixon did decades ago, when he set the passive precedent that Obama is now trying to reverse.